Empty Keys UI v1 and Game Menu Module released today. Thanks everyone for helping with beta. The MonoGame "team" is mostly just myself and @KonajuGames right now. And as much as I try to... I can't fix everything myself. There just isn't enough time in the day. We really have been lucky lately to have a few people like thefiddler, @daveleaver, and @Nezz contributing lots of fixes and features. We need more people like them contributing. I am personally waiting to make my contribution. I haven't quite found what it will be yet. It's made harder given that I am running all my projects off the Release installer on the main home page for MonoGame, but when I change it to GitHub source I will push any changes that I make. Version 1.1 released today. Added new Password Box control, support for Click Mode on all button types and support for Value Converter attribute. Version 1.2 released today. Added new features for binding and fixed lots of issues. There is new experimental multi thread support too. There is a NuGet package for those, who prefer that. Think I'll give EmptyKeys a go. @flicon, are there options to change element colours etc.? I know this is an old topic, but it's one of the reasons I was inspired to start working on this scene / GUI editor. There's still a few things to do before it's usable. I thought now might be a good time to start talking about it. I built the editor for my own projects, but I've always had it in the back of my mind that the MonoGame community might benefit from something like this. My goal is to figure out if this is something the MonoGame community might be interested in? Also, in the not to distant future, I'd like to get a couple of volunteers to use the beta version and provide feedback about it. This will be a fairly informal process of emailing each other, or discussing it on the forums. We'll be trying to figure out how to best use it in actual games, and what features are most important. Version 1.3 is out with lots of fixed issues and updated support for FNA (MonoGameSDL2). Read release notes for more info. There is a new version 1.4 of Empty Keys UI. Animations supported and lots of fixed stuff. See release notes for more info. Maybe there should be a forum about MonoGame extension libraries. Since MonoGame is just a framework and needs a lot of extras to make games I think it makes sense to have somewhere to talk about this stuff. Version 1.6.5 is released. I focused on memory profiling in this release and enhanced support for Tool Tips and custom Windows. UI library was updated to use MonoGame 3.4. More info on forums. MonoGame examples are using MonoGame content pipeline now. Examples using Nuget are not updated to MonoGame 3.4. Very nice work. Looks great. Would you be able to update the banner on the front page of the Empty Keys site to use the current MonoGame logo? Hi-res logo images can be found in the MonoGame.Logo repo. Sure, I updated the one in examples, forgot bout web. Empty Keys UI v1.7 is out with new Debug Window for Visual Tree debugging, TreeView, better DataGrid support and much more. I can picture this being used to construct a game creation tool similar to Unity. It's editor UI is done by their own in-engine UI, and I see Empty Keys as being quite capable of doing a similar thing. Yes, you could use it for applications too, tho it's not "primary" goal. I was thinking to test that on MonoGame Pipeline tool. 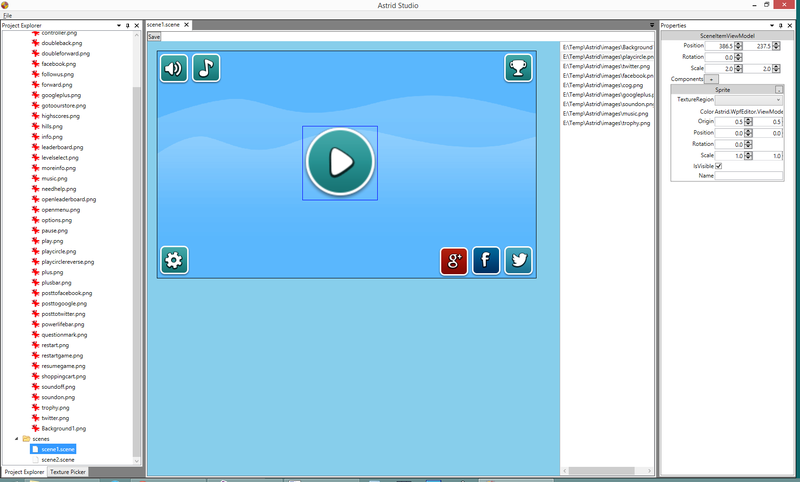 One UI, one code for all platforms, didn't have time to do so yet.